Google is set to pay the largest fine ever imposed on a single company by the US Federal Trade Commission, according to the Wall Street Journal. It says the search giant is close to agreeing to pay $22.5m (£14.5m) to settle a privacy complaint. It follows an earlier report which revealed Google had bypassed a "do not track" setting selected in Apple's Safari web browser. Google has indicated that its action had been an unintentional mistake. The Reuters and Associated Press news agencies both quote an unnamed source who has confirmed the report. The Wall Street Journal revealed in February that a Stanford University researcher had noticed that Google had exploited a loophole in Safari. It allowed Google's cookies to be installed via adverts on popular websites even if users' browsers' preferences had been set to reject them. This allowed the firm to track people's web-use habits even if they had not given it permission to do so. Google says no personal information was collected. Safari is the default browser on Apple's iPhones, iPads and Macintosh computers, and is also available for PCs. 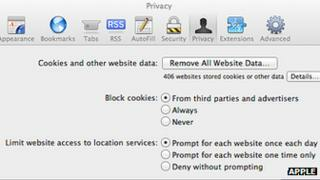 When installed, its preferences panel is set to reject tracking cookies by default. Concerned about privacy, ExtremeLabs managing director Tom Henderson decided to live a Google-free life. "I had to make a decision," says Mr Henderson. "Do I like the terms of service and am I willing to abide by it to use Google's products? And the answer in both cases was no." Read more about his methods in the BBC Magazine. Is it possible to quit Google? The paper said that Google had taken advantage of the fact that Safari allowed multiple cookies to be installed on a device as long as its user had given permission for a first cookie to be downloaded. It said the search firm's code had made Safari think the user had filled in an "invisible form" allowing the process to be triggered. Google had previously told users that they could rely on Safari's settings to avoid it tracking them. When the article was published the firm announced it would halt the process. It added that the do-not-track workaround was an unanticipated side-effect of its efforts to personalise its Google+ social network's accounts. A previous legal settlement with the FTC meant the agency could fine Google a maximum of $16,000 per day for each violation of its privacy practices. Bearing in mind millions of users were likely to have been affected, the sum could have been significantly larger than the settlement fee now suggested. The FTC declined to comment on the Journal's latest report. A Google spokesman said the firm could not comment on the "specifics" of the case, but provided an emailed statement. It said: "We... set the highest standards of privacy and security for our users." "The FTC is focused on a 2009 help-centre page published more than two years before our consent decree, and a year before Apple changed its cookie-handling policy. "We have now changed that page and taken steps to remove the ad cookies, which collected no personal information, from Apple's browsers." Google may also face penalties from other regulators outside the US. It is also facing probes into its Street View vehicle's collection of personal data without users' permission.